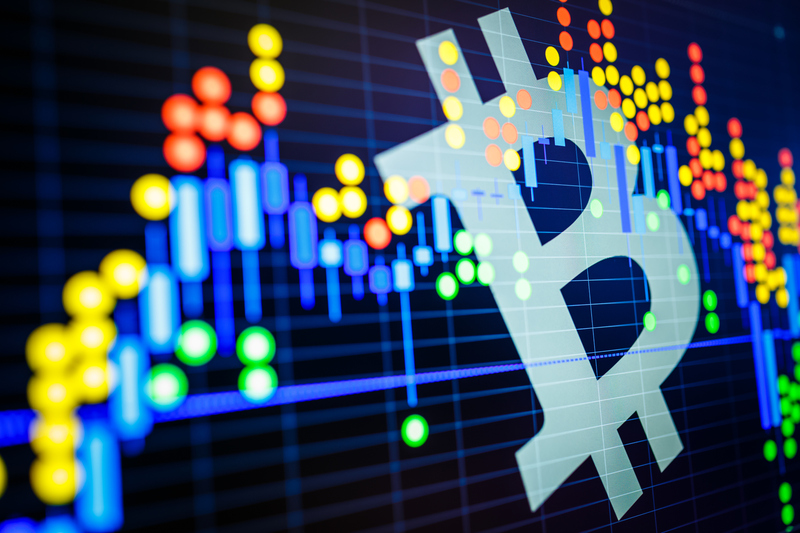 Cryptocurrency exchanges are the hubs of digital currency trading. They’re kind of like online banks mixed with the stock market, only instead of checking accounts and brokers in expensive suits, you get digital wallets backed by blockchain technology. There are hundreds of cryptocurrency exchanges out there today, and choosing the best one isn’t a simple task. Every exchange has a different purpose and caters to a different audience segment. Want to use hard currency (fiat) to buy bitcoins? Looking for a way to invest in one of the lesser-known cryptos? Maybe you’re just interested in swapping altcoins between wallets. No matter your aim, there’s an exchange out there ready to serve. 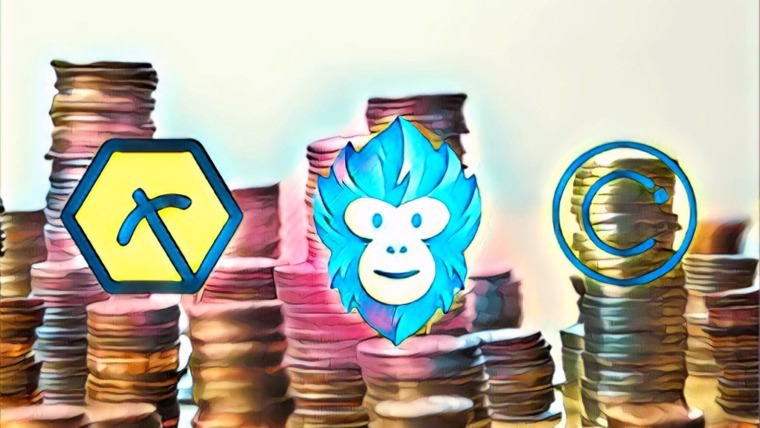 In this article, we share our picks for the best cryptocurrency exchanges in the market today. The best cryptocurrency exchanges have a good reputation with the community, charge low fees, have a painless account verification process, and offer just the right mix of features to facilitate buying and selling. Your specific needs will vary depending your cryptocurrency investment plans, but the areas below are important no matter what. Reputation – How trustworthy is the exchange? They’ll be handling your money (possibly lots of it!) and they’ll have access to your personal details. Make sure the exchange is legit before signing up. Search user reviews, read impressions on Reddit, and check reliable websites for commentary on the exchange. You’ll always find a horror story or two, but as long as there are more positives than negatives, you’re good to go. Fees – How much does the exchange charge for each transaction? Reputable exchanges state their fees in plain language right up front. They vary depending on the transaction type and funding source, but anything below 3% is considered acceptable. Also watch for hidden withdrawal fees. Some exchanges keep trading fees low but offset the loss with high withdrawal fees. Payment Methods – How can you get money into your exchange wallets? Some services focus on coin-to-coin transactions, but others let you pay in fiat with a bank account, credit card, or wire transfer. Verification Process – Most exchanges require some form of account verification before you can make trades, especially if you link a bank account or credit card. This involves sending a photo of your passport along with your name, address, and phone number. Lengthy verification delays aren’t uncommon, either. Geographical Restrictions – Not all exchanges are available worldwide, and not all features will be available in every region. Make sure you’ll have full buy/sell access before signing up. Security – Most reputable cryptocurrency exchanges employ standard security features to keep your account safe. A few go to extra lengths to protect your money and identity, adding things like SMS verification, complex captchas, or even avoiding personal details altogether. If you’re just starting out in the cryptocurrency world, you’ll want a reliable exchange that offers fiat transactions. This means you can link a bank account or credit card to the service and use hard currency (USD, EUR, GBP, etc.) to buy altcoins. Exchanges like this usually charge higher fees than crypto-to-crypto exchanges, and you’ll have to go through a strict verification process before trading, as well. Coinbase is one of the best-known cryptocurrency exchanges in the world. The company was founded in 2011 and took just six years to amass a user base of 13 million people. It’s well-funded, well-liked, and extremely easy to use, providing just the right tools first-time buyers need to dip their toes into the cryptocoin market. Buying and selling through Coinbase is a smooth experience. You start by verifying your identity with quick passport or ID uploads. Next you add wallet or fiat payment methods, including bank accounts or a credit card. It can take a few hours for these to get verified, but once they do, you’re good to go. Just head to the Coinbase dashboard and start loading your cryptocurrency wallets with coins. Coinbase serves over 30 countries spread across Europe, North America, and beyond. Both buying and selling are enabled in most of these areas, including the U.S., Singapore, and the UK. At the time of writing, account holders in Canada and Australia don’t have the ability to sell coins for fiat, but Coinbase promises a solution is on the way. Every exchange comes with a few caveats, and Coinbase is no exception. Users report everything from lost transactions to expenditure tracking outside of the exchange. Nothing too dramatic, especially given the harsh nature of the cryptocurrency world, but it’s something to keep in mind. 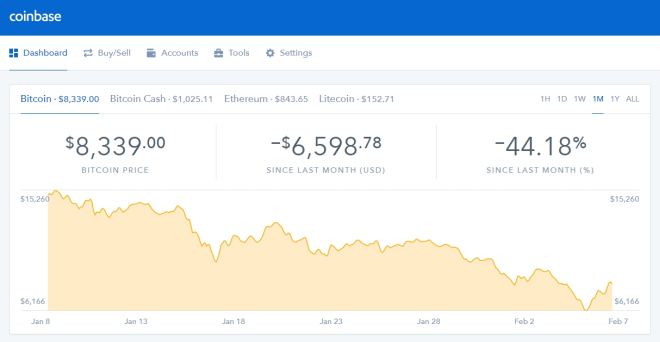 Despite this, Coinbase remains one of the best exchanges to start your cryptocurrency investing with, especially if you’re in the U.S. and only want to deal with the more popular cryptos. Kraken was one of the earliest trading platforms for serious cryptocurrency enthusiasts. It was founded in 2011, about the same time Coinbase made its appearance. Instead of catering to newcomers in the crypto community, Kraken focused on detailed, high volume trading through live graphs and automated wallet transfers. It still dominates the niche to this day and is consistently ranked as one of the lowest cost, highest reliability exchanges around, even with that unfortunate 40 hour stretch of downtime in early 2018. As anyone who uses Kraken will tell you, this platform takes cryptocurrencies seriously. 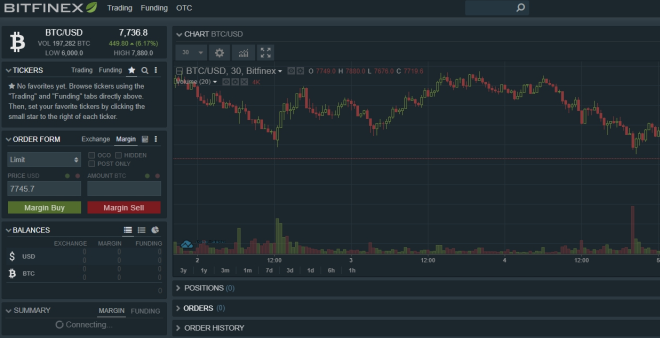 The interface is packed with trading pairs, value charts, and tons of buying and selling options, including advanced features like margin trades. The amount of information is overwhelming, especially for newcomers, but it’s perfect if you want to maximize your investments and get the most out of your holdings. Account creation and verification with Kraken is both simpler and more involved than its competitors. The company doles out access in five different levels, each requiring more information to unlock. Signing up with just an email puts you at Tier 0. You can’t trade at this level, but you can familiarize yourself with the interface. Going to Tier 1 allows digital-only trades but requires a verified name, date of birth, country, and phone number. Tier 2 adds fiat transactions (credit card, bank account), Tier 3 raises the trading limits, and Tier 4 opens all of Kraken’s advanced features. It’s inexpensive, it offers a wide variety of altcoins, and it delivers a ton of trading information right to your dashboard. If this isn’t your first cryptocurrency rodeo, Kraken is one of the best exchanges you can partner with. 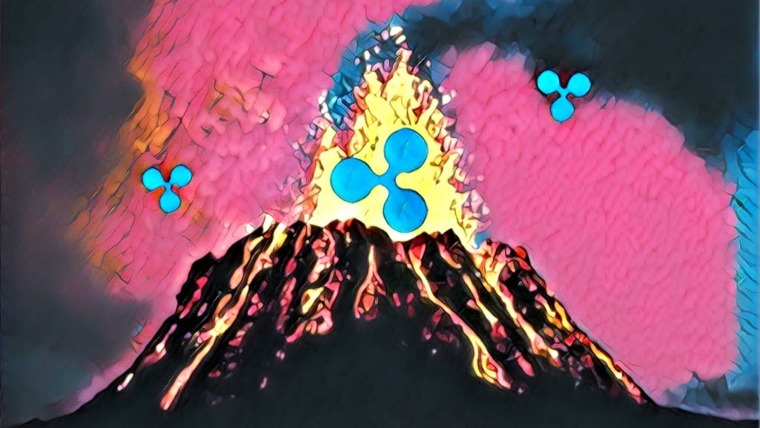 Countries Served: Canada, Europe, Japan, U.S.
Bitfinex moves a massive volume of cryptocurrencies, almost double that of its popular competitors Coinbase and Kraken. It achieves this by catering to expert-level investors with significant holdings who would rather trade than let coins sit idle in their wallets. With Bitfinex, you’ll have access to multiple order types, plenty of automated buying and selling features, margin trading, and a margin funding market, all of which support dozens of cryptocoins. You can even send funds to and from fiat accounts. Account verification with Bitfinex is intense. Not only do you have to supply your core information, but you also need two forms of valid, government-issued ID, a copy of a recent bank statement, and proof of your address from a utility bill. At the time of writing, Bitfinex is experiencing significant verification delay, which means a 6-8 week wait before you can trade. It’s also worth pointing out that if you let currency sit in Bitfinex wallets for too long, you could incur a small inactivity fee. 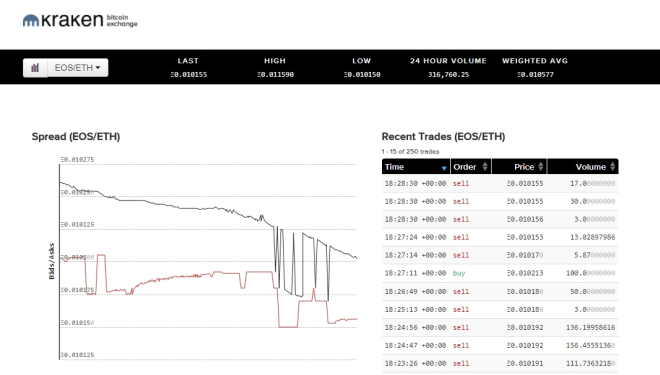 These are some serious obstacles to climb over, but then again, Bitfinex is a serious exchange for serious investors. LocalBitcoins isn’t what most people think of when they hear the words “bitcoin exchange”. The site ditches speculation features and bank account transactions in favor of good ol’ person-to-person trading. Like the name suggests, LocalBitcoins lets you search for real humans and swap bitcoins with them directly. Users set trading prices and outline requirements for buying/selling, then LocalBitcoins makes the introductions and provides buyer and seller protection via escrow. LocalBitcoins doesn’t require a lot verification, making it one of the more anonymous methods of buying and selling cryptocurrencies. You do have to enter a real name to make trades, however, and it’s a good idea to verify your email address and phone number for security purposes. 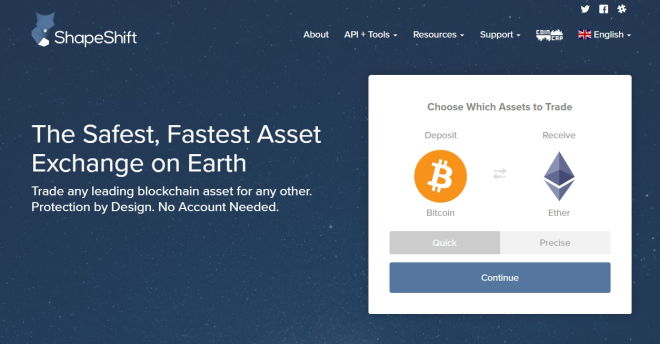 Benefits of using LocalBitcoins include worldwide availability, super low transaction fees, and a massive variety of payment options, including bank accounts, PayPal, and even Amazon gift cards. The main drawback lies in the hit-or-miss nature of trading with multiple different people. Just like any online marketplace, some will be easy to work with and others will be an absolute nightmare. Bitstamp is a European cryptocurrency exchange that hits somewhere in the middle as far as usability and features are concerned. It’s not quite as beginner-friendly as, say Coinbase, but it does support an extra digital currency, allows both deposits and withdrawals from a wider range of countries, and boasts incredibly low fees for all transactions. Bitstamp’s sign-up process is essentially on-par with other exchanges. To create a trading account, you’ll just need to upload images of your passport or license along with proof of residency. There can be huge delays in getting your account approved, sometimes to the tune of a few weeks or a solid month. Patience is key! Once you have verified access, it’s easy enough to hop in and start buying altcoins through Bitstamp. Its trading features are pretty slim, but as far as obtaining and storing currencies goes, it gets the job done. Bitstamp offers trading pairs in half a dozen major cryptocurrencies with both US dollars and Euro. You can also fund your account using a wire transfer, credit card, or even SEPA deposits from an EU bank. Bitstamp is one of the top cryptocurrency exchanges for new to mid-level holders. 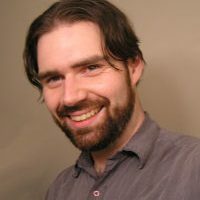 It hits a great balance between wealth of features and a straightforward interface, and community members aren’t shy about heaping praise upon it, which is always a good sign. Best For: Traders in Europe who are serious about cryptocurrency. Scoring high on the “friendly exchanges” list, Coinmama aims to provide a straightforward buying and selling interface that supports two of the most popular currencies, Bitcoin and Ethereum. The overall experience manages to hit the mark, too. The interface isn’t cluttered or confusing, there are plenty of help articles to guide you along, and the purchasing process is surprisingly smooth. Account creation with Coinmama is a little more nuanced than with some exchanges. You start by providing basic details, things like phone numbers and your mailing address. If you plan on spending less than the equivalent of US$150, your verification ends there. To go over that limit, you have to send in photos of a government-issued ID card. Because Coinmama structures its buying system in preset amounts, you’ll only be able to make a single small purchase before completing verification. One of Coinmama’s biggest draws is the number of countries it serves. The list is over 215 strong, ranging from Europe to Asia to all across the Americas. Everyone is able to both buy and sell coins, though there are minor purchasing and account restrictions depending on the region. It’s worth noting that Coinmama doesn’t serve every state in the United States. Before creating your account, check the list to make sure you’re good to go. The biggest downside to the Coinmama experience is the fees. The exchange itself tacks on a 5.5% fee to every transaction, more than twice the amount many of its competitors charge. And if you use a credit card, you can expect an additional fee of 5% added on top of that. 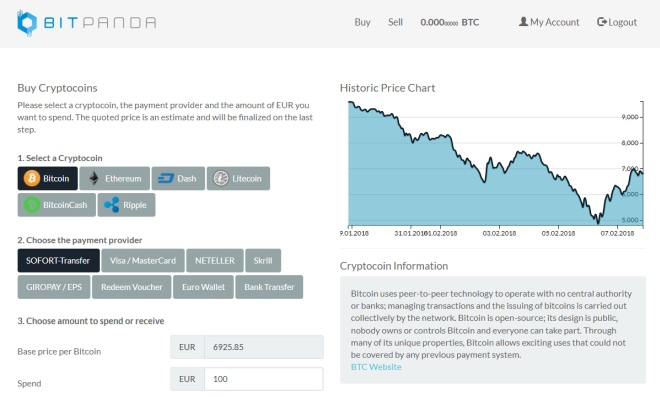 These two combined makes Coinmama one of the most expensive exchanges to use, though it tries to make up for that with its slick dashboard interface. 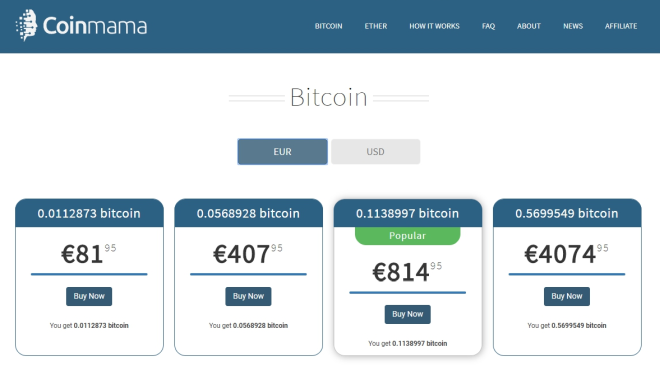 BitPanda wants to make it easy to spend bitcoins. The Austrian company pulls out most of the complex trading data in favor of a transaction-focused interface. Want to buy, sell, or send Bitcoin Cash? Two clicks and you’re on your way. It’s even possible to withdraw funds as Amazon.de vouchers, which is probably where you were going to spend half the money, anyway. BitPanda structures its account creation and verification processes around trading limits. A basic account only requires an email address but doesn’t let you buy coins, just sell them. Confirming a few details bumps you into the Silver category so you can get some trading done. If you’re serious about cryptocurrency, you can also go for Gold verification which raises your limits significantly. If you just need to buy and sell a few common cryptocurrencies, BitPanda is a great exchange to start with. The Europe-only limitation to buying does strip out some of the functionality for the rest of the world, and the fees aren’t as low as we’d like. 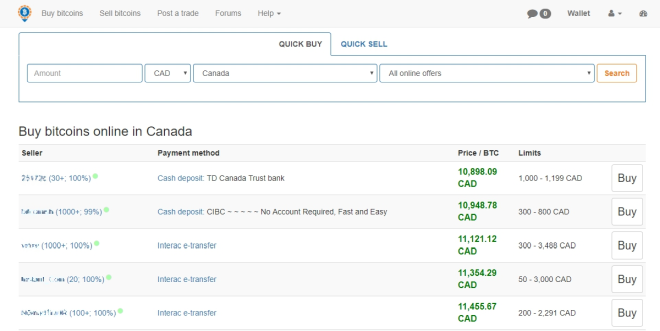 Still, it’s an easy exchange to use if you want to move currencies around without fussing over complicated dashboards. Fees: 2 – 4% depending on the payment method used. Crypto-to-crypto exchanges offer a trading pairs marketplace that lets you buy and sell altcoins for other cryptocurrencies. No bank accounts or fiat transactions involved, just digital transactions between digital wallets. This allows for lower transaction fees and a greater focus on upping your investment game, but it can be confusing for newcomers to the crypto world. The Hong Kong-based KuCoin was only founded in September 2017, but it already has a steady following. One of the main reasons for its explosive growth is the ability to earn passive income through the KuCoin referral program and buying KuCoin Share tokens. The former encourages people to spread the word about the exchange, while the latter pays a dividend based on how much of KuCoin’s currency you hold. It’s a slightly different exchange experience, but it’s surprisingly smooth and straightforward. Outside of its extras, KuCoin offers an uncluttered interface built for moving money. Its charting features are minimal at first but expand when needed. Buying and selling just takes a few clicks, and you can trade between more coin pairs than other exchanges. KuCoin is also one of the first places where a lot of new and niche coins show up, making it hotbed of crypto-buzz activity. KuCoin has a section for validating your account with a photo ID and a selfie, but it isn’t necessary for trading, just referral linking. If all you want to do is buy and sell, you simply need a valid email address and a separate digital wallet to transfer coins out of. The EtherDelta exchange focuses exclusively on trading ether and tokens issued using the ERC20 standard. If it’s a popular, active currency on the Ethereum blockchain, EtherDelta likely has an available pair. You’ll have to wade through a dense interface to get any buying or selling done, but you won’t be burdened with things like country restrictions or ridiculous transaction fees. Just hop on and start trading. Account creation with EtherDelta is simple and anonymous. All you have to do is click the dropdown menu, choose “new account”, and you’ll receive a public wallet address along with a private key. That’s it. No verification or personal details required. The tradeoff is you don’t get fiat access through a credit card or bank account, but if you’re digging this deep into the cryptocurrency scene, we’re guessing that’s not a deal breaker. Our “How To Use EtherDelta” article can guide you through the process of trading on this exchange. The cryptocurrency exchange Binance is a relative newcomer to the scene, but it has already attracted a healthy customer base thanks to low fees and a grand variety of coins to trade. 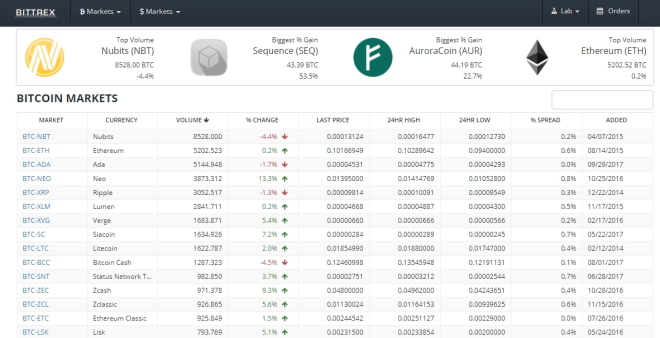 The interface will be off-putting for newcomers, as it’s packed with charts and trading pair numbers updated in real-time. Once you get used to the details, you’ll find it’s a surprisingly cozy way to shift digital currencies around to get some real trading done. Binance doesn’t deal in fiat, meaning no bank account or credit card transfers are allowed. This does help prevent some of the verification issues present in other exchanges, however. All you need is a valid email address to create an account, then you’re ready to deal. Verification is optional and allows for higher daily withdrawal amounts, so if you need to move more than the equivalent of 2 BTC during the day, get your passport ready. It may lack some of the convenient features found in other exchanges, but it’s hard to argue with Binance’s focus on smart trading and strong security. The service has even seen surges of as many as 240,000 new users in an hour, so you know it must be doing something right. If you don’t need fiat access, Binance is an excellent exchange to try out. Fees: 0.1% for all transactions. It sounds crazy to admit, but ShapeShift’s marketing tagline summarizes the service extraordinarily well: Easy, Safe, Competitive. This rudimentary cryptocurrency exchange exclusively focuses on swapping coins, cutting out things like fiat transfers and bank account transactions in favor of straightforward wallet-to-wallet trades. There’s no bidding, no centralized holding structure, and no service or transaction fees; just fast currency swaps between your own private holdings. ShapeShift doesn’t require an account, so there’s no verification process to complete or personal details to enter. All you need are two wallet addresses, one for the deposit and one to receive the coins, that’s it. There’s a minimum to the amount you can exchange per transaction, making it difficult to shift small amounts of currencies, but otherwise you’re free to swap as you see fit. If you’ve already got a load of coins and are eager to buy into a new cryptocurrency, ShapeShift is one of the best ways to do it. Poloniex walks the line between user-friendliness and complex investing features, but it manages to do so without alienating either group. 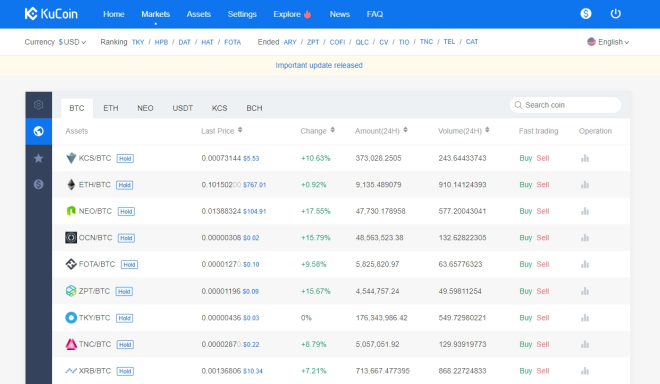 The exchange has a clean interface, features dozens of altcoin pairs, offers both margin and lending trades, and is available to users around the world. If you already have coins stuffed in a few different crypto wallets, Poloniex can help you expand your investments with a minimum of fuss. Verification on Poloniex is required to make any deposit or withdrawal. To start the process, you’ll enter basic information like your name, phone number, and address, then send in a selfie that adheres to the Poloniex photo guidelines. It feels a bit awkward taking a photo for a crypto exchange, but it’s safer than snapping shots of your passport. Another area where Poloniex walks a fine line is customer service. 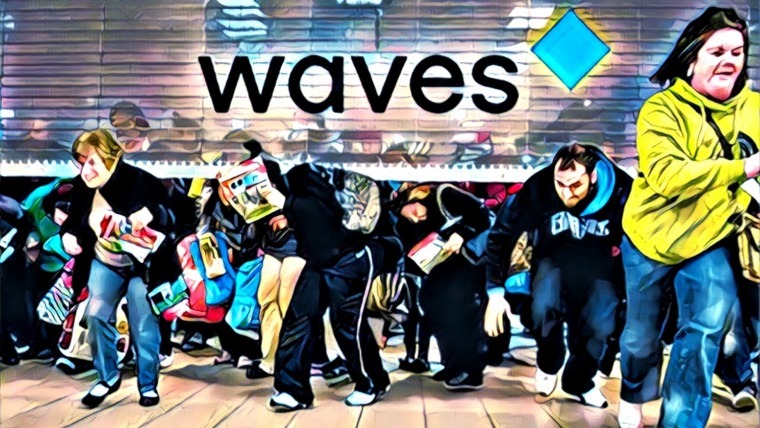 The company has received its fair share of complaints, many of which center around lengthy ticket response times and a poor resolution track record. Some of this ill-will dates back to 2014 when Poloniex lost over 12% of its bitcoins in a hack. There hasn’t been any major security issues since then, but it may be helpful to note that their ticket response times are still pretty bad. Bittrex is a mid-level exchange that leans towards simplicity. The services focuses on providing as many coin trading pairs as possible, letting you move popular currencies like Bitcoin and Ethereum alongside lesser-known assets like FirstBlood and Aragon. The charting is crude and not all that useful, though, so depending on your level of investment knowledge, you may want to look elsewhere for financial details. There are two levels of account verification with Bittrex: basic and enhanced. The former sets a trading limit at 0.4 BTC per day and requires a few basic details so Bittrex can match your identity with public records. Failing that (and it often does fail), you’ll need to proceed to enhanced verification. Here your trading limit is bumped up to 100 BTC per day, but you’ll need to submit an ID scan and selfie. It’s also worth noting that at the time of writing, Bittrex has been closed to new non-corporate accounts for almost two months. Even though it’s fairly easy to use and offers a lot of good trading pairs, Bittrex does have some drawbacks. The biggest is its track record with customer service. 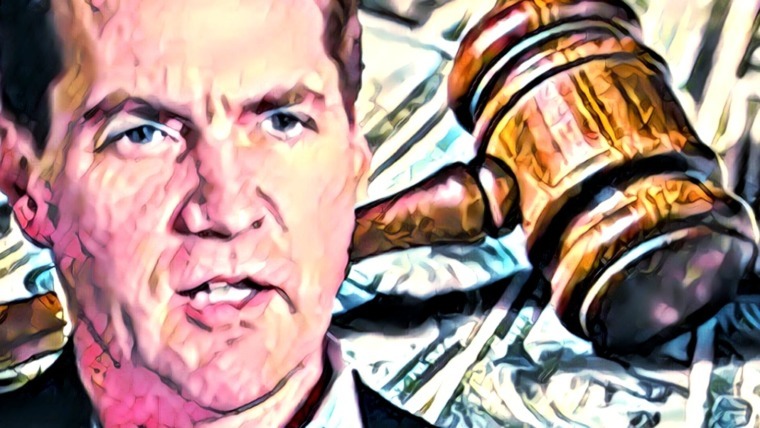 Missing transactions, disappearing funds, and hair-pulling email exchanges with representatives are just some of the complaints leveraged against the exchange. If everything goes smoothly, it’s a good exchange; but if something goes wrong, get ready for frustration. It seems like a new exchange pops up every other week. Some of them are legitimate competitors to the established services above, but others are looking to make some quick cash. The best defense against scams is to stick with reputable sources. The more popular an exchange is, the more likely it’s going to stick around. If you’re just starting out in the cryptocurrency world, pick a simple broker to get a few coins in your pocket and some experience under your belt. After a few weeks or months, you can branch out to new services as you get more serious about investing in blockchain technology. 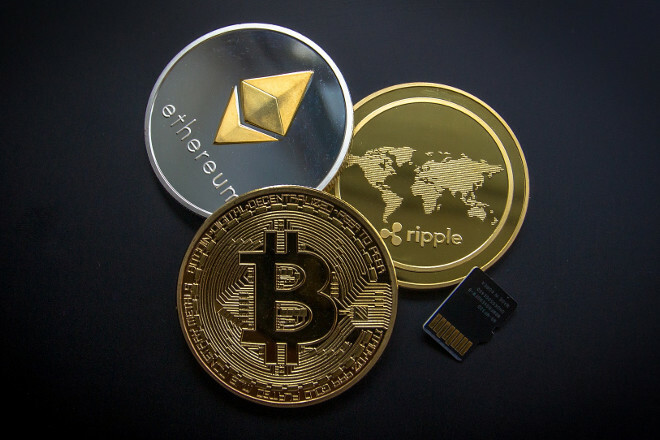 More importantly, know that the best cryptocurrency exchange for you is the one that best suits your situation and needs. Got a preferred exchange you think should be on the list? We’d love to hear your thoughts in the comments below! Hey Dave! Care to expand on your opinions? What don’t you like about Kraken, and why do you think Bitshares is good?